You want to own a Lake Havasu home. Paying a monthly mortgage doesn't scare you. However, saving up for the down payment can feel a bit overwhelming. 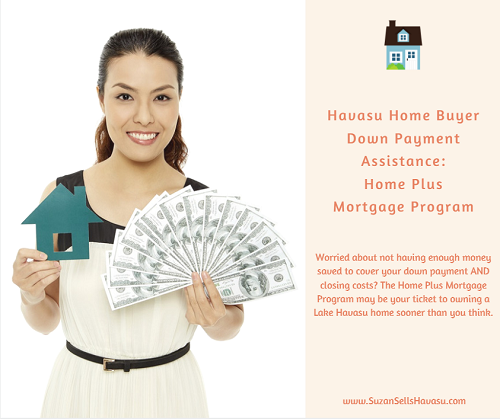 Did you know that the government provides a Havasu home buyer down payment assistance program? It's called the Home Plus Mortgage Program and it might be just the boost you need to become a homeowner whether you're a first-time home buyer, a self-employed professional or are looking for your "forever" home. Down payment assistance has been readily available for the Havasu home buyer for several years now. This acts as a "secret second mortgage" that works in conjunction with your initial home loan. Therefore, you need to meet the requirements for whichever home loan you initially apply for (Fannie Mae, Freddie Mac, FHA, VA or USDA). So, your first step should be to talk to a lender. As a "secret second", this Havasu home buyer down payment program acts like a lien. Instead of payments, it "forgives" 1/36th of the total borrowed (3%, 4%, or 5%) each month for the first three years of your mortgage loan. It is completely interest-free. At the end of three years, you are free to refinance your mortgage loan or sell your property. But not before. Veterans can opt to borrow up to 1% more. You decide the amount you need to borrow for your particular situation. First of all, the home in question must be your primary residence. You're going to need to have a decent FICO score to be approved for a Home Plus Mortgage loan (640 for Fannie Mae or Freddie Mac, 660 for all others). The sale price cannot exceed $371,936. Your annual household income cannot exceed $92,984. Your debt-to-income ratio must be no larger than 45%. Remember, this Havasu home buyer down payment assistance program works with your mortgage loan. It is not an independent application. Talk to your lender about what option works best for you. 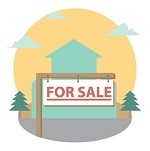 When you're ready to start looking for a home, contact me.